Greece in 1948 was a country reeling from two major conflicts. The Nazi occupation and World War II had left it weakened, and the Greek Civil War -- already raging for two years -- had torn it apart. One of the earliest clashes of the Cold War, Greece's civil dispute pitted the American-backed royalist government against the Soviet-funded Greek Communist Party. 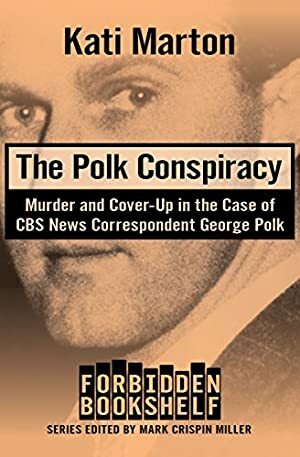 Reporting at the front lines for CBS News, George Polk drew the ire of both sides with his uncompromising and incisive coverage. In mid-May, days after going missing, Polk was found dead, shot execution style with his hands and feet bound. What transpired next was a mad scramble of finger pointing and international outrage. To appease its American backers, the Greek government quickly secured the dubious confession of a Communist journalist -- though the bulk of the evidence pointed to the royalists. An influential moment in the early days of the Cold War and a powerful force in the formation of the Truman Doctrine, the Polk conspiracy was emblematic of the ideological conflict that would embroil the globe for the next forty years. Log In to track Kati Marton on eReaderIQ. to be notified each time the price drops on any book by Kati Marton. to stop tracking Kati Marton. Log In to track Mark Crispin Miller on eReaderIQ. to be notified each time the price drops on any book by Mark Crispin Miller. to stop tracking Mark Crispin Miller. We started tracking this book on September 3, 2014. The price of this book has changed 90 times in the past 1,693 days. The lowest price to date was $1.99 last reached on December 28, 2018. This book has been $1.99 17 times since we started tracking it.